Two homes under one roof. Rent one or both together. 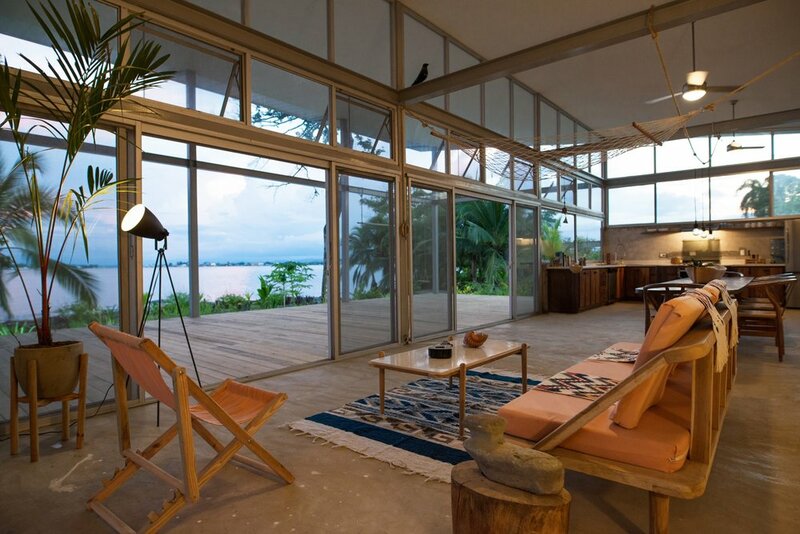 Casa Comunal is truly one of a kind in Bocas del Toro. 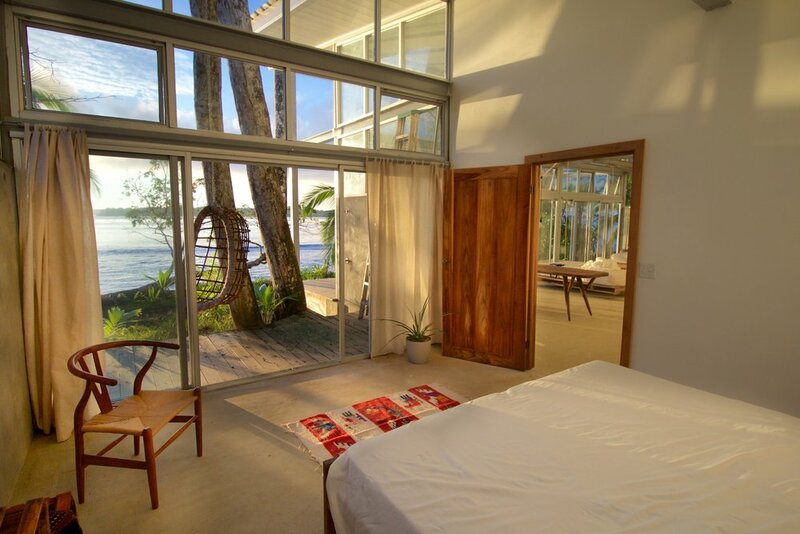 The home's minimalist architecture is applied with careful consideration to enhance the expansive views of the Caribbean and beyond while the landscaping augments the original treescapes around which the home was built. It boasts 284 square meters (3050sq.ft.) of interior space with an additional 160 square meters (1722 sqft.) of covered deck space outside. 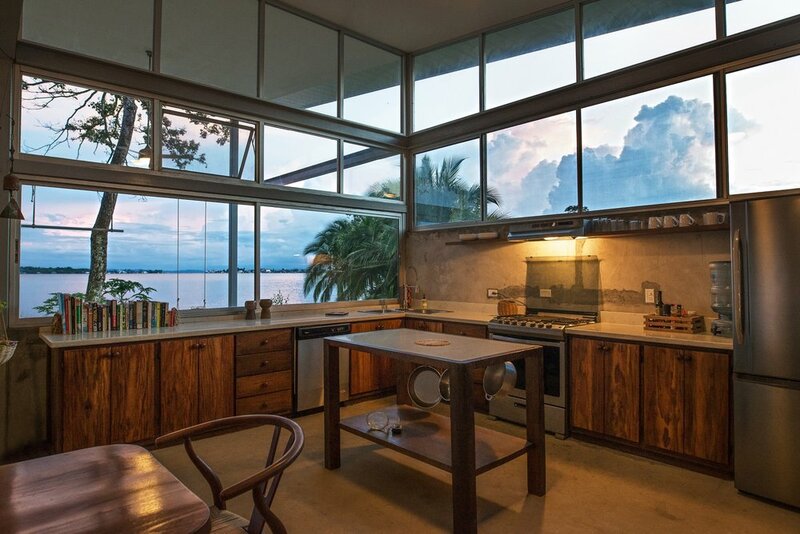 The property is 1,213 square meters (1/3 acre) total with 56 meters (184 feet) of private beachfront. It can be rented as one large, single home or two separate homes that share a dividing entryway room in the center with walls that can slide closed and lock for privacy. Each home also has its own private deck, separated by an atrium in the middle. When divided, the larger of the two homes, "Casa Norte", is a 3 bedroom, 2 bathroom. 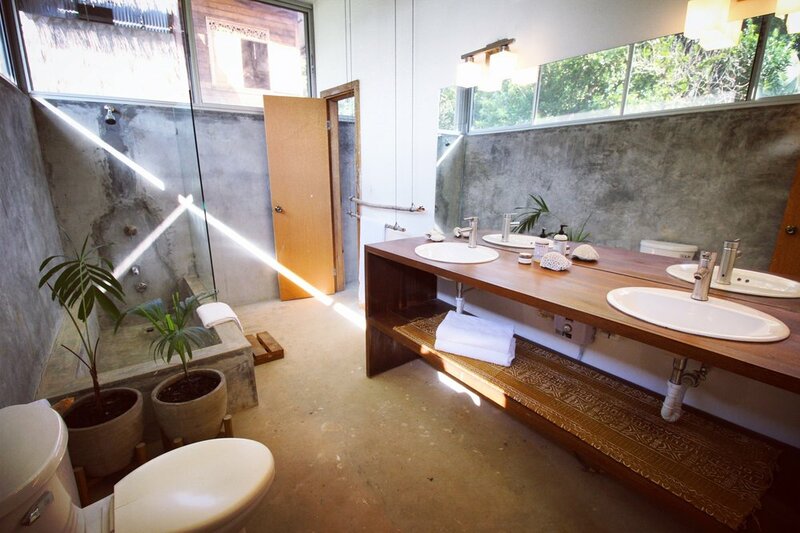 The master suite has has a king bed (200 x 200 cm)and its own large bathroom with an oversized soaking tub. 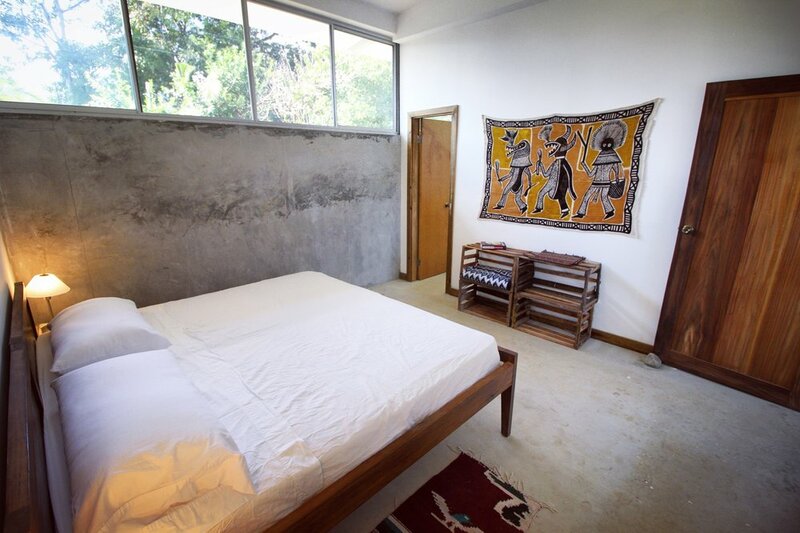 The second bedroom has a king and the third, a king bed and a twin-sized (100 x 200 cm) sofa bed. 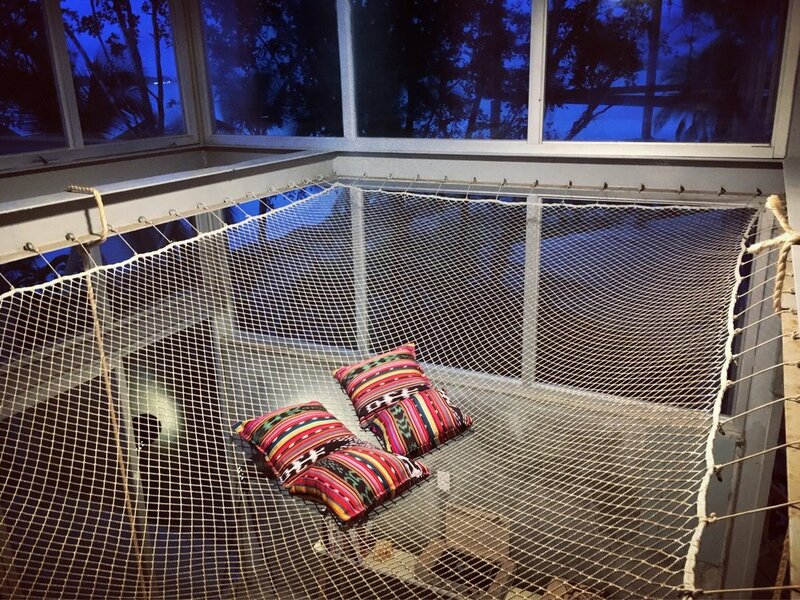 In addition there are two full-sized hanging beds in the large living room. All king beds can be pulled apart into two twins to accommodate up to 9 guests in a variety of configurations. The smaller house, "Casa Sur", has a 2 bedrooms and 2 bathrooms. The master suite has its own private bathroom with an oversized soaking tub. The second bedroom has a king bed and its own bathroom. The kitchen is particularly well appointed in this unit, with a larger corner layout, kitchen island, oven and dishwasher. Including the couch, this house can sleep up to 5 guests. 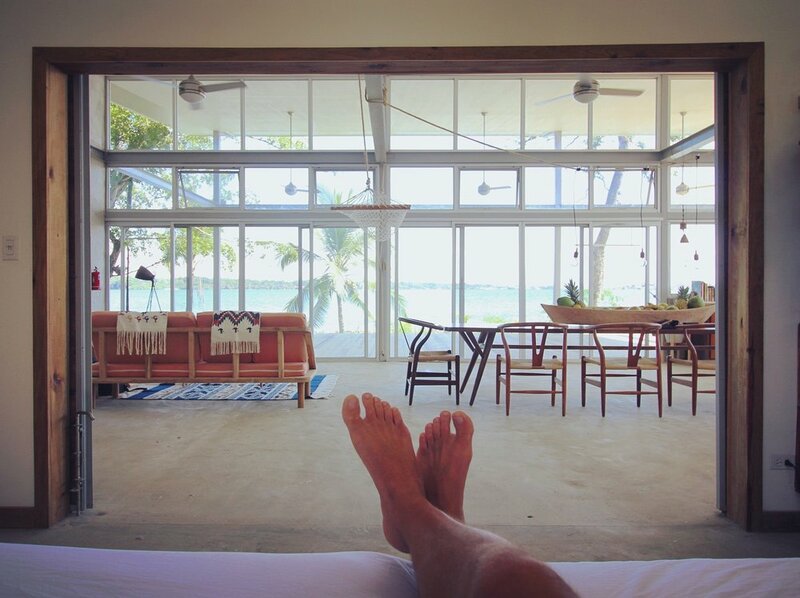 When rented together as one home, Casa Comunal can sleep at total of 14 guests. Please inform our staff as to your party's needs and we can prepare the bed configurations accordingly. 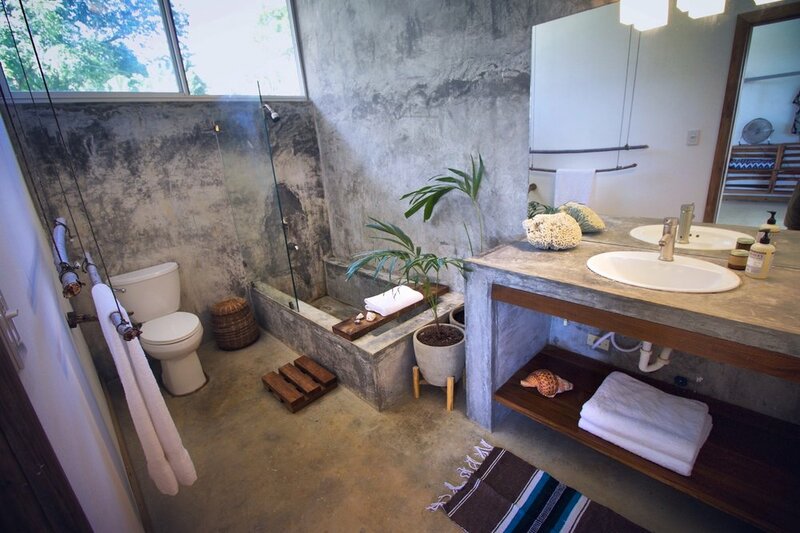 Designed with sustainable living in mind, the water system runs off of rain catchment, and a landscape filled with tropical fruit bearing trees provide an abundance of healthy, organic delicacies. In addition, many of the furniture pieces were handcrafted by local woodworkers out of reused building materials and/or naturally fallen trees. Great effort has been taken to reduce our energy consumption while maintaining maximum comfort for our guests. The lighting system runs highly efficient, warm-colored dimmable LED bulbs. For temperature control, the home's orientation and window and ceiling fan configurations were designed with natural cross breeze patterns in mind to maximize airflow throughout. *Sliding walls (as depicted in yellow) can be closed to create two, separate homes or opened for one large, open plan. Check-in is at 3pm, Check-out is at 10am. Please ask if you need an exception. The Casa Comunal Bocas Community Contribution fee is non-refundable. A reservation is officially canceled when the guest sends an email with the word Cancellation in the Subject Line and includes wording indicating an intent to cancel. The official date of cancellation will be recorded as the date and time the email was sent.